One thing that must be kept in mind when approaching this 1968 movie masterpiece is that director Stanley Kubrick is a satirist. He attacked the war machine and tyranny in Paths of Glory and Spartacus. In Dr. Strangelove, possibly the best film satire eve made, Kubrick not only skewers the male/sexual connection in waging war, but also goes after technology as something that facilitates the drive for destruction. It is in 2001 that the director takes on the idea of progress being measured only by technological achievement. The opening sequence, “The Dawn of Man,” shows us earth’s beautiful, but imposing land vistas. These scenes dwarf the individual creature. In a way, this appears to be the first “space” humanoids encounter. Add the howling wind of the soundtrack to the intimidation of the size of the terrain depicted and Kubrick triggers the primal response of fear in the audience. The ape-like ancestors that we now encounter are also frightened by this environment. At one point a leopard leaps onto one of these unsuspecting creatures, emphasizing the danger in this prehistoric time. They huddle together at night, watchful of threatening surroundings. When one group tries to drive away another from a watering hole, they scream, howl, and jump up and down. The scene is comical. But, isn’t Kubrick saying that things haven’t really changed over the millennia, since we still do a great deal of posing and threatening as we try to take over the land of others? Do these early humans remind us of today’s politicians? 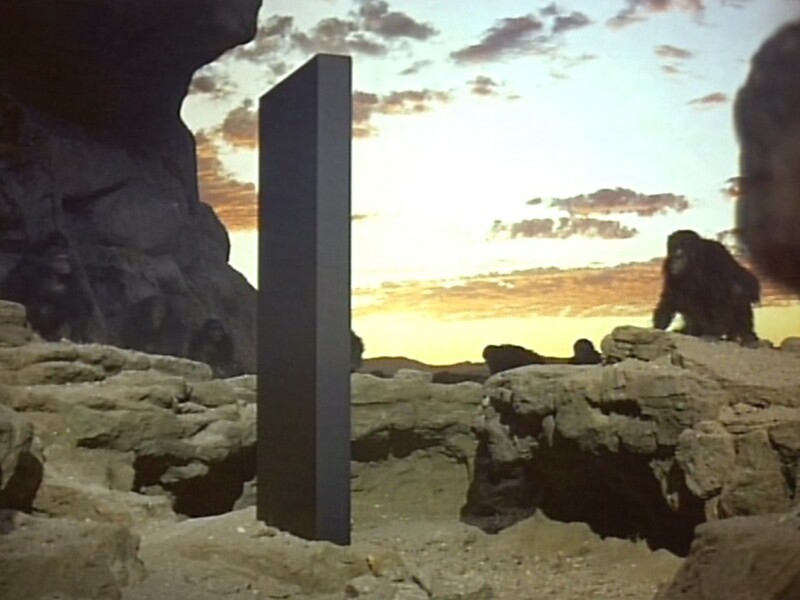 One of the ape-ancestors wakes up and sees a mysterious black monolith. He, as are his companions, is afraid to approach it at first, but then, human curiosity takes hold, and they all touch it. After that, the ape-man looks at the monolith, and we are given an upward shot of the object and the sky above it. He then realizes that he can use a bone as a tool. The irony here is that the first bit of mechanical advancement is a weapon. The ape people can now kill animals and those of other groups of their kind to take the land they want. After the conquest of the watering hole, the ape-man throws his bone/weapon into the air. We then jump centuries into the future as the bone segues into the image of a spacecraft. But, the appearance is similar to the bone, and thus Kubrick implies that we may not have advanced as much as we would like to think. We hear Johann Strauss’ Blue Danube as we see a variety of spacecraft move through the blackness. “Craft” is the operative word here, since we are talking about something made from a skill, but the music is art, which is an imaginative talent that transcends technological invention. Kubrick does not show us humans dancing to the waltz. Instead, it is our machines who have replaced us, and in a sense, we now have a world that is dehumanized. Dr. Heywood Floyd arrives at the space station amid rumors that there is an epidemic at the Clavius colony on the moon. On his trip, a flight attendant wears grip shoes to deal with the lack of gravity. This footwear makes her lurch, and she appears to move like one of her ancient ape-like predecessors, again undermining human advancement. He has a short meeting with fellow scientists who press him about the true story concerning the outbreak. Floyd feigns ignorance and then says somewhat slyly that he can’t reveal anything. This scene is somewhat reminiscent of the watering hole episode in the first part. One of the scientists looks over his shoulder as someone passes by, appearing suspicious of a threat, like the ape-man. Heywood is the dominant creature here, as the others try to draw him out. In the background we see that there is a Hilton Hotel, and an AT&T logo, along with one for the restaurant chain Howard Johnson. 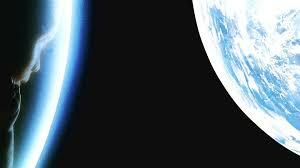 Kubrick is saying that although this is supposed to be the “enlightened” future, corporate greed is forever, with the drive for profits advancing into outer space. Floyd makes a video phone call to his child, played by Kubrick’s daughter, Vivian. This new technologically advanced world has not brought people together. Floyd can’t even be home on his daughter’s birthday. He can only contact her through a technological instrument. When he asks his daughter what gift she would like to receive, she at first says a telephone. In a way that request makes sense because it is the only thing that lets her connect with her father. 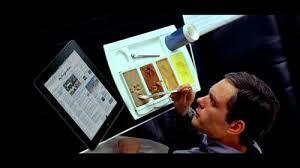 This scene shows that in this future all we have are tech gadgets, but no real closeness to others. One could say here that this film is quite prescient, given our current withdrawal into computerized social media. The accepted argument is that technology is supposed to make our lives easier. But Kubrick shows Heywood looking baffled by the numerous instructions on how to use the anti-gravity toilet. The more we move forward, it seems, the more our basic human drives and functions have become encumbered. We hear at a briefing on the space station that the rumor of a contagious outbreak on the moon is a cover story. The truth is that another monolith was found on the moon, placed there about four million years in the past. Heywood visits the place where the monolith thrusts out of the surface of the moon. Kubrick mirrors the scene of the prehistoric human touching the object as we see Heywood do the same, and we are provided the same upward shot of the monolith and the sky above. We have different celestial bodies, but the same action, again shrinking the time difference and questioning the so-called progression of the species. Heywood and the others don’t have a clue as to the immense significance of the find, and instead use the moment for a photo-op. The monolith lets loose a high-pitched, pain-producing noise, almost like an angry alarm clock, telling the humans in front of it to pay attention to what they are experiencing. We then skip ahead eighteen months, and we see the Discovery spaceship on its way to Jupiter. The spacecraft looks like the vertebrae of a spinal column with the brain at the front. This image reinforces the bone - to - tool connection made earlier, and also stresses that although we have advanced technically, our humanity has not moved that far forward. The film introduces the two crew members who are not in hibernation (three others have been placed in suspended animation). There is Commander Dave Bowman (Keir Dullea) and Dr. Frank Poole (Gary Lockwood). The nonhuman member is the HAL 9000 computer (the voice provided by Douglas Rain). (As Michael Benson points out in his book, Space Odyssey, Bowman's name refers to Odysseus who must bend a bow and shoot an arrow as a test to claim his wife after his travels). The movie again demonstrates our dwindling humanity when Kubrick echoes the happy birthday call via video phone, this time with Poole’s parents calling their son. They show him his special day cake, which he can’t consume because of the distance between them. We may feel revulsion at the ape-people eating raw meat, but it appears more like food than what these astronauts have on board the Discovery, which is pureed mush. When Heywood eats sandwiches with others on the moon shuttle, it is said that the food is something like chicken, and that they are working on the substances that substitute for real food. Obviously, in this future, culinary delights have not progressed. The gulf between Poole and his father and mother is not just physical, but is also emotional. Poole demonstrates no response to the communication from his parents, not a smile nor a tear. Actually, all of the dialogue by the so-called advanced humans in the film is lacking in any originality, humor, or wit. The entity that sounds and acts more human that the real people is, ironically, the computer. HAL (you probably have heard that the letters are one position above the letters IBM in the alphabet) shows pride in his generation of computers. (Benson notes that HAL's camera eye is a nod to the cyclops, a monster, in The Odyssey). He uses the evocative human word “silly,” and later says “he is afraid” and says, “I can feel it” when his higher functions must be deactivated. Unfortunately, his actions show the negative side of his human programming. His paranoia about people messing up the mission, for which he may be blamed, and which his pride cannot tolerate, causes him to lie about the malfunction of some equipment, and then uses the extravehicular space pod to kill Poole. (In Benson's book, he notes Kubrick's admiration for filmmaker Ingmar Bergman. The chess game between Poole and HAL echoes the match between the knight and Death in Bergman's The Seventh Seal, and foreshadows Poole's demise at the hands of HAL Kubrick put in a false move in the game to hint at HAL's malfunctioning or deceptive strategy). The pod looks like a human turned into a high tech monster, with its mechanical arms reaching out menacingly at us as we view it from the victim’s position. 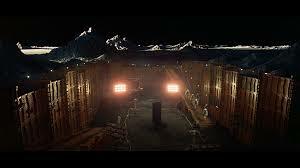 It appears to be Kubrick’s way of saying that the machines we have produced can be our undoing. The people in hibernation are also killed. Bowman goes out to retrieve Poole’s body, but must abandon that plan because HAL tries to leave him stranded outside the ship. Bowman comes in through an emergency hatch, even without his helmet. 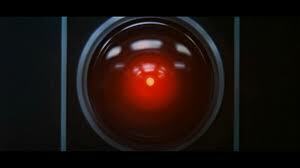 While he renders HAL harmless, the computer sings the song “Daisy,” with the funny line, “I’m half crazy,” in it, reflecting its own mental state. But, the lyrics also talk of the nostalgic “bicycle built for two,” which refers to an antique, fun mode of transportation, again letting us know that our advanced spaceship takes us far away, but the technology is not the end-all of life. 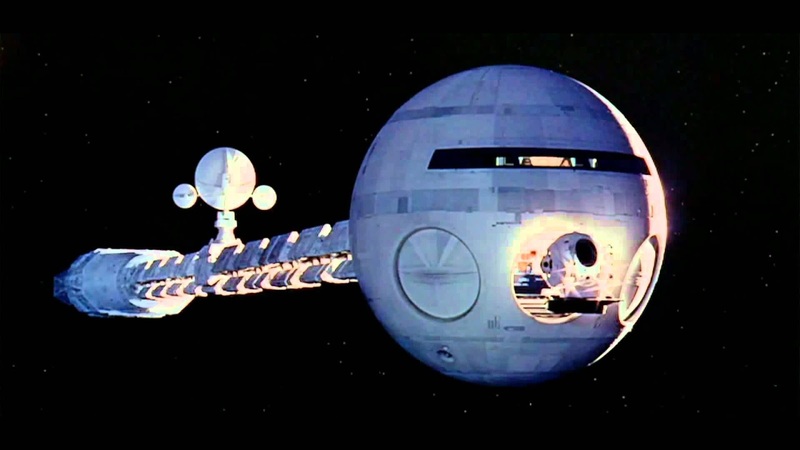 As Bowman approaches his destination, the last segment is entitled “Jupiter and Beyond the Infinite.” The satire part of the movie now ends. There is another monolith floating in the space near the large planet, and Bowman, in his space pod, enters what appears to be a wormhole. 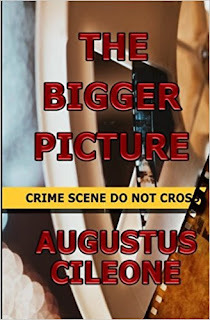 He (and we) experience a dazzling light show, as it appears we see the birth of star systems, and witness the grandeur of “the Infinite.” The monoliths can be evidence of a super extraterrestrial race, or as Benson says, substitutes for the gods in Greek mythology. They also may be symbolic evolutionary markers we must reach to move forward. But, technology can only take us so far. Bowman’s journey ends, in a surreal sequence, in a bright white bedroom with Louis XVI furniture. He has aged, and he sees himself in stages of aging, and becomes the elderly versions of himself. When he is in his death bed, the monolith appears at the foot of the bed. He reaches out his hand toward it, reminding one of the Sistine Chapel where God’s finger touches Adam. He is reborn as a star child, a heavenly fetus, who then floats by earth, contemplating his origins. The next film is Straw Dogs.